From 2006 to 2008, internet use among Latino adults rose by 10 percentage points, from 54%1 to 64%. In comparison, the rates for whites rose four percentage points, and the rates for blacks rose only two percentage points during that time period. 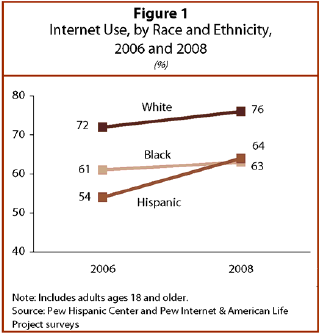 Though Latinos continue to lag behind whites, the gap in internet use has shrunk considerably. While U.S.-born Latinos experienced a two percentage point increase in internet use from 75% in 2006 to 77% in 2008, foreign-born Latinos experienced a 12 percentage point increase during the same period, from 40% to 52%. In 2006, 31% of Latinos lacking a high school degree reported ever going online; in 2008, this number was 41%. In comparison, Latinos with higher levels of education experienced three to four percentage point increases in internet use. Internet use among Latinos residing in households with annual incomes less than $30,000 increased 17 percentage points from 2006 to 2008. For Latinos in households earning $30,000 to $49,999 annually, internet use increased two percentage points, and for Latinos in households earning $50,000 or more annually, there was no change in internet use. Whereas Latinos gained markedly in overall internet use, the pattern of home internet access changed very little. In 2006, 79% of Latinos who were online had internet access at home, while in 2008, this number was 81%. White and black internet users show a similar leveling off. In 2006, 92% of white internet users had a home connection, compared with 94% in 2008. In 2006, 84% of African American internet users had a home connection, compared with 87% in 2008. While there was little increase in the likelihood of having a home connection among internet users from 2006 to 2008, rates of broadband connection increased dramatically for Hispanics, as well as for whites and blacks. In 2006, 63% of Hispanics with home internet access had a broadband connection; in 2008 this number was 76%. For whites, there was a 17 percentage point increase in broadband connection from 65% to 82%, and for blacks, the increase was from 63% in 2006 to 78% in 2008. Among Latinos, English-reading ability was linked with internet use—81% of Latinos who read English very well were online, as compared with 63% of Latinos who read pretty well, 52% of Latinos who couldn’t read English well, and 24% of Latinos who couldn’t read English at all. Conversely, Spanish-reading ability was not associated with internet use at all among Latinos. Native-born Latinos had higher rates of internet use and a greater likelihood of having a broadband connection among home internet users. 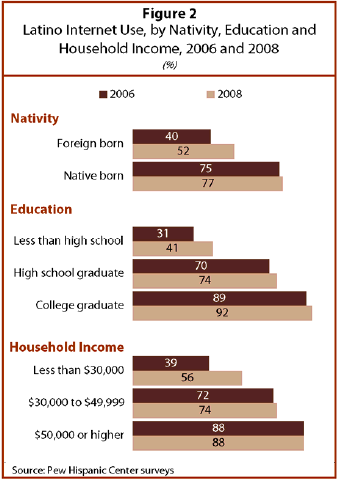 Some 77% of native-born Latinos used the internet, as compared with 52% of the foreign-born. While 83% of native-born home internet users had a broadband connection in 2008, this share was 68% among the foreign-born. Younger Latinos were more likely to use the internet than older Latinos. Among Latinos ages 18 to 34, 77% used the internet; among those ages 35 to 49, 65% used the internet; among those ages 50 to 64, 53% used the internet, and among Latinos ages 65 and older, one-quarter used the internet. Education was linked with increased use of the internet, and greater likelihoods of having a home internet connection, and having a broadband connection among Latinos. Some 41% of Latinos lacking a high school degree went online in 2008; almost three-fourths (74%) of Latinos with a high school degree went online, and 92% of Latino college graduates went online. Among internet users, 64% of Latinos lacking a high school degree had a home internet connection in 2008, as compared with 84% of Latino high school graduates, and 94% of Latino college graduates. Some 62% of Latino home internet users who lacked a high school degree had a broadband connection in 2008; this share was 78% for Latino high school graduates, and 86% for Latino college graduates. For Latinos, higher household income was associated with internet use, having a home internet connection, and having a broadband connection. Some 56% of Latinos in households earning less than $30,000 annually went online in 2008, as compared with 74% of Latinos in households earning $30,000 to $49,999, and 88% of Latinos in households earning $50,000 or more annually. Among Latino internet users, 71% of those with annual household incomes less than $30,000 had a home connection in 2008, as did 83% of those with household incomes of $30,000 to $49,999, and 92% of those with household incomes of $50,000 or more. Some 71% of Latinos with annual household incomes less than $30,000 who had a home internet connection had broadband access in 2008; in comparison, this share was 79% for Latinos in households with income of $30,000 to $49,999, and 85% for Latinos in households with incomes of $50,000 or more. This report focuses on patterns of technology use among Latinos, whites, and African Americans from 2006 to 2008. The estimates used in the report are derived from a total of eight telephone surveys, three of which were conducted for the Pew Hispanic Center, and five of which were conducted for the Pew Internet & American Life Project. All told, the Pew Hispanic Center surveys interviewed 7,554 adults, and the Pew Internet & American Life Project surveys interviewed 13,687 adults. All references to whites, blacks, Asians and others are to the non-Hispanic components of those populations. “Foreign born” refers to persons born outside of the United States to parents neither of whom was a U.S. citizen. Foreign born also refers to those born in Puerto Rico. “Native born” refers to persons born in the United States and those born abroad to parents at least one of whom was a U.S. citizen. The surveys used to compare changes in internet use among Hispanics did not include cell phone samples. Studies by the Pew Research Center for the People & the Press have documented that the exclusion of cell phone samples produces only small levels of bias on most questions, but measures of technology use tend to be affected more by the absence of cell phones than other kinds of measures.